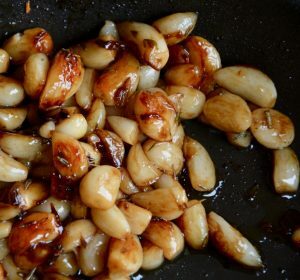 Caramelising Garlic | Patrice Newell's online organic biodynamic Australian garlic and olive oil. 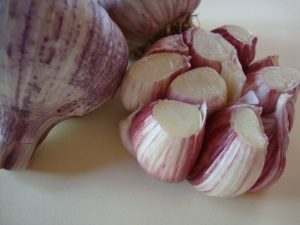 When we started growing garlic – I started cooking a LOT of garlic and slicing the top off a bulb and baking it whole was my preferred way of serving cooked sweet garlic. If I have less time I’ll break open the bulbs, leave the skins on, slice the ends off the big cloves ( this helps remove the skins when cooked) toss with salt and lots of olive oil and bake the cloves in foil ( in the wood BBQ ) or wrapped in baking paper or in a ceramic dish with foil or paper on top and within 15 minutes they’ll be soft. Then bake for another 10 minutes with no lid or open up the paper or foil. This will brown them off. If I have more time ( or people in the kitchen to help ) we peel the skins from the fresh cloves and caramelise – just as Ottolenghi suggests in his garlic tart recipe. But without the precise timing etc. We serve the sweet garlic with roast dinners as a side dish with all the other vegetables. Place peeled garlic cloves in a small saucepan and cover with cold water and bring to a gentle simmer for 3 minutes then drain through a colander or sieve. Wipe the saucepan dry then add the cloves back in with some olive oil and fry on a high heat for 2 minutes, no more, then add some balsamic vinegar, (1/2 teaspoon per bulb) more water (quarter cup for 2 bulbs should be enough) and bring to a gentle simmer for around 10 minutes. Then minutes add a teaspoon of sugar per bulb, a sprinkle of chopped rosemary, chopped thyme and ¼ teaspoon salt and continue to cook on a medium heat until most of the liquid has evaporated and the garlic cloves are coated in a dark caramel syrup. 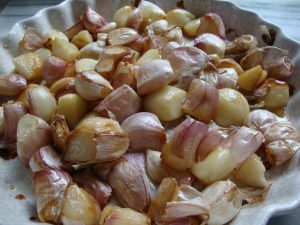 If the cloves are still a little too hard, add a bit more water and simmer longer – or if I have time, sometimes just putting the lid on will let it steam to soften further. I find measurements are hard with this – because bulbs sizes vary so much and obviously a small clove cooks more quickly than a big one. And there’s such a huge variation in acidity with balsamic vinegars. Also, using a good quality pan helps, otherwise the garlic can stick if you over caramelise and end up like mash. Everyone loves this sweet edition when I do it ( in a good pan ) ……it’s worth a go.